We use our iPhones all day long listening to music, texting, following driving directions. After a few hours we realize the battery is almost depleted and there’s nowhere to charge the phone, or we don’t have a Lightning connector or spare battery. Yikes! What to do? The Macally 3000 mAh Battery Case is the perfect solution. 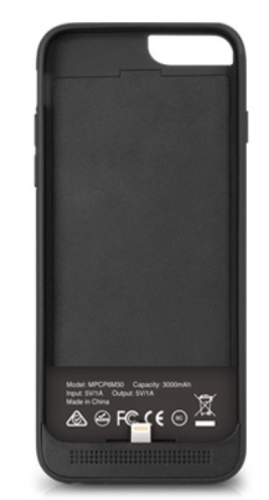 The Macally 3000 mAh Battery Case is made for the iPhone 6. It has a smooth rubberized finish that’s easy to grip and hold. The Macally web site claims the battery case is lightweight, but I have to disagree on that point. It definitely felt heavier at first, but I got used to it quickly. It’s incredibly simple to put on the iPhone and remove in just a matter of seconds. When I took the Macally 3000 mAh Battery Case out of the box it was still at 75% charge. Four LED dots on the back of the case indicate remaining charge, in increments of 25%, with four lit dots being fully charged. Hold down the button on the back of the case under the dots to check remaining charge. Continue holding until you hear the familiar charging sound for the battery to kick in. The case will charge with or without the phone. If the iPhone is in the case, most power will go to the phone, after which the power will go to the battery. Test One: iPhone is at 50% battery. I turned on the battery charger; 90 minutes later my iPhone was at full charge, all while following the Red Sox game on the MLB app. Three lights were still lit, meaning the Macally 3000 mAh Battery Case still had 75% power. Very impressive! Test Two: iPhone is at 49% battery the next day. Haven’t charged the case and it’s still showing three lights. I charge my phone, and 57 minutes later the case ran out of juice. But my battery is at 92%. Again, impressive. I found if I was charging the phone while listening to music that it charged slower, even occasionally losing battery, as opposed to my using the phone for other purposes. However, music seems to kill my battery, so having the case in charging mode let me listen longer. The Macally 3000 mAh Battery Case has a speaker at the bottom front of the case, and easy access to the charging port and headphone jack. I wish the included charging cable was longer but it’s not a deal breaker. If you like to use headphones with your iPhone that can be an issue, depending on your brand of headphones or earbuds. My earbuds have a L shaped connector that doesn’t fit into the Macally 3000 mAh Battery Case. The Apple earbuds fit but in order to remove them from the case I had to yank on the thin cable. I’m afraid that would destroy the earbuds very quickly. You may need to remove the case to listen to audio if your specific earbuds or headphones are incompatible, which isn’t convenient. Or, for a few dollars, pick up an audio cable extension, like one of these on Amazon. Overall, I really love the Macally 3000 mAh Battery Case. I have two trips coming up, and a few of those days I’ll be taking lots of pictures, which also uses a lot of battery. Knowing I won’t have to carry an extra battery or worry about finding a charging station will make my trips that much more enjoyable. For under $70 (even less if you buy on Amazon) you’ll never run out of battery when you need your iPhone the most. MyMac Podcast 574: Apple event? What Apple event?